While researching Facebook's metrics over time, I stumbled upon two data sets that, together, confirmed a hunch I'd had, namely that Facebook ad CTR and intelligence are inversely correlated. The scatter graph below shows Facebook ad CTR by state (X axis, data from WebTrends*) and state smartness (Y axis, data from the Morgan Quitno State & City Ranking Press). 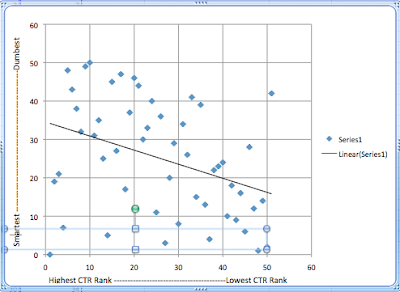 States in the top 50% of Facebook ad CTR have rank 32.6 in 'smartness' vs. 18.36 for the bottom 50% of ad CTR states. 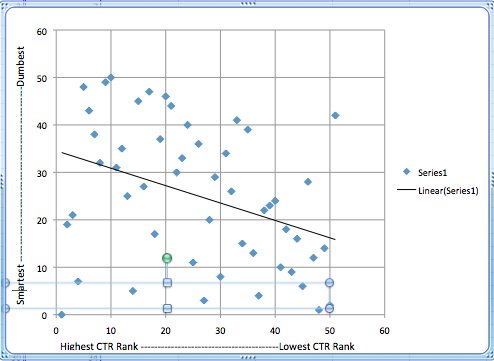 States in the top 20% of ad CR rank only nominally lower in smartness (33.8) than the top 50% (32.6), but the bottom 20% in ad CTR are significantly smarter (14.8) than the bottom 50% as a whole (18.4). Hawaiians might not be the smartest (#42), but unlike their unsmart peers, they rarely click on ads (dead last in ad CTR). But then again, if you're living in Hawaii, what more do you need? It is of course worth noting that the Morgan Quitno state ranking methodology is merely a proxy for the relative smarts of people in various states, but I do think it's sound enough to prove that Facebook ad CTR and user intelligence are most probably inversely correlated. Now, if I could just get my hands on some by-state Google CTR data. Anybody? Source: Facebook Advertising Performance Benchmarks & Insights Whitepaper from Webtrends, published January 2011. Have you ever considered adding more videos to your blog posts to keep the readers more entertained? I mean I just read through the entire article of yours and it was quite good but since I’m more of a visual learner, I found that to be more helpful well let me know how it turns out! I love what you guys are always up too. Such clever work and reporting! Keep up the great works guys I’ve added you guys to my blogroll. This is a great article thanks for sharing this informative information.. I will visit your blog regularly for some latest post.